On December 21, 2010 we will see a total lunar eclipse on Winter Solstice, an event that has not occurred since 1638 CE. Decembers always seem to bring transitions, and Saturday, December 11, 2010 will mark the 20th anniversary of the passing of Marvin Argyle Everett (1909-1990), who could have been one of my favorite characters in any number of Robert Heinlein’s marvelous stories. There’s more about “Marv” in a post I did in 2008, called Papyrus 2.0. These two very different individuals provided much of the fabric from which I made my coat of many colors, through my childhood and into manhood. Marvin Argyle Everett was not a scientist, writer or politician. He was a teacher and factory worker who knew more about the science of making soap for Procter and Gamble than all the junior execs who came through on their way somewhere else. He gently asked them not to step in his pile of floor sweepings in the Dallas P&G plant, while they queried him on the operations of the saponification process section he ran for over 20 years. He was also a Sunday School Teacher for the Men’s Class in the Baptist Church in our town for more than a decade or so. He taught me how to find the answers for all but the most technical or philosophical questions. He did not teach answers but taught how to find them, which is a distinctively different process. From the juvenile sci-fi books of Heinlein, and more exactly the later adult stories, I learned to open my mind to explore galactic alternatives to the sodden life in South Dallas County in the 50’s and 60’s. From Podkayne of Mars, The Moon is a Harsh Mistress, The Glory Road and Stranger in a Strange Land, I imagined that my ‘boy hick’ would someday travel the stars, and meet the Empress of the Seven Universes. Little did I realize then that all these tales would come true, not in some distant world, but right here in Parker County. Together my heroine and I conquer worlds of villains, from the comfort of our stone cottage. Marv would not have agreed with very much of what Heinlein had to say in his stories, but in my cooling tower of a brain the two provided me with all the number crunching, text processing, emotional roller coastering that I have needed to build a pretty damn good picture of life. The enigmatic nature of the literature of Heinlein is that his heroes were often misfits, orphans, accidents, or inconvenient additions to whatever world in which they found themselves. This underdog mythos speaks volumes to most of us nerds, geeks, and generally Animal House denizens, who wind up on the Supreme Court or running the Olympics. Wow! Dinkum good. 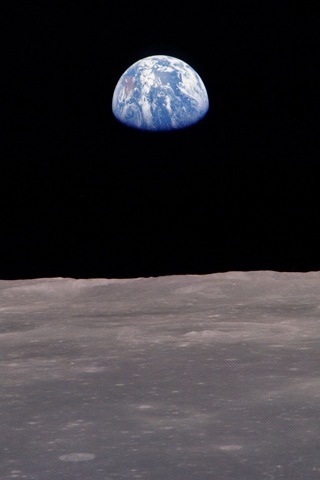 On Christmas Eve, forty years ago today, the crew of Apollo 8 pointed their television camera back toward Earth and shared their vision with the entire world. On December 21, 1968, Frank Borman, James Lovell and Bill Anders set out on the first ever journey to the Moon. Three days later they became the first humans to enter lunar orbit. The National Space Society wishes everyone a happy, healthy, and awe-inspiring holiday season. While the Heinlein Centennial was celebrated in 2007, this article in the Wall Street Journal bears another look. “Robert A. Heinlein’s Legacy” By TAYLOR DINERMAN ~ WSJ July 26, 2007; Page D7. There are some fairly good FaceBook groups providing information, links and discussion of the works, quotes and point of view of Heinlein, real or imagined.